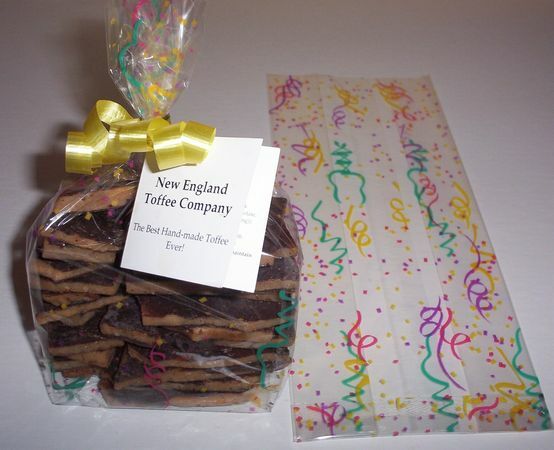 New England Toffee Company offers four sizes of cello bags, with various designs. Cello bags are FDA approved for Direct Food Contact. Cello bags of toffee are sold here individually. 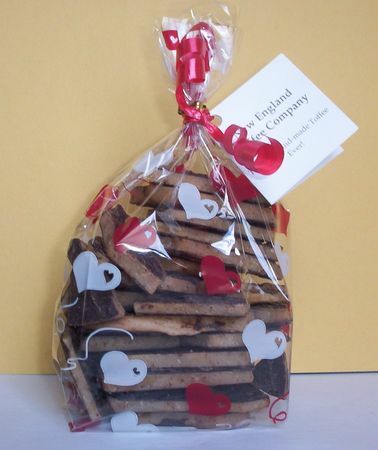 They are also offered with most of our Gift Baskets and Containers. NOTE: Our supplier carries some of these bags in additional sizes, and they also offer other designs. Please contact us to special order and allow an extra 1-2 weeks for delivery. All of the cello bags are clear or clear with a printed design, and are gusseted (pleated) on the bottom, which allows them to stand up. Each bag is described below. Pictures are taken against a colored background so that the design can be seen. 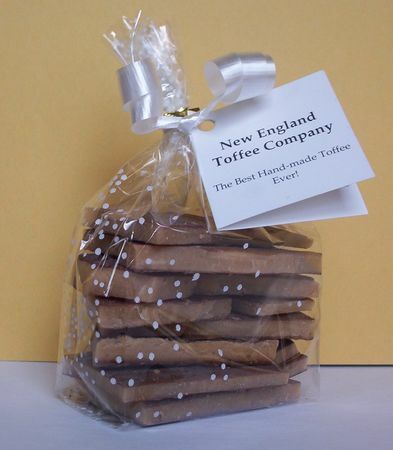 NOTE: Assorted Toffees are offered in the 8 ounce size or larger. The clear bag can be used for any occasion. It comes in 4 ounces for $5.00 and 8 ounces for $9.75. NOTE: Assorted Toffees are offered in the 8 ounce size. 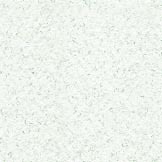 The White Sprinkles bag has tiny white specks all over it. It is great for any occasion. The bag comes in 4 ounces for $5.00, 8 ounces for $9.75, and 1 pound for $19.00. 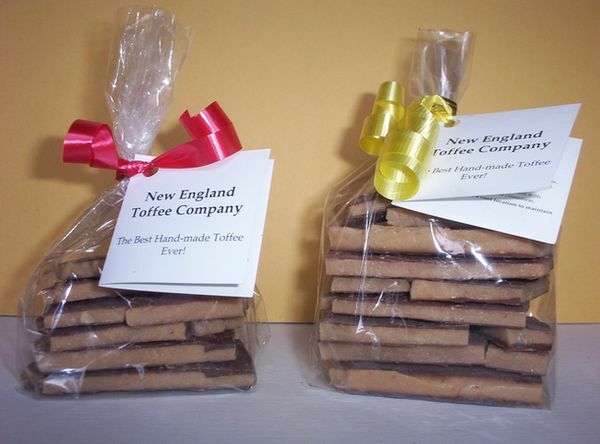 NOTE: Assorted Toffees are offered in the 8 ounce and 1 pound sizes. The Primary Dot Bag has red, blue, yellow and green dots splashed all over it. The bag comes in 4 ounces for $5.00, 8 ounces for $9.75, 1 pound for $19.00 and 2 pounds for $36.00, and can be used for any occasion. 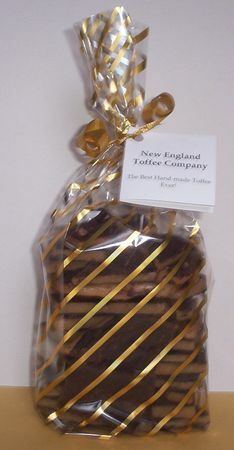 NOTE: Assorted Toffees are offered in the 8 ounce size and larger. The Diagonal Metallic Gold Stripe bag has a thin metallic gold stripe that crosses the bag diagonally about every 1/2". This is an elegant bag that works well for any occasion. The bag comes in 8 ounces for $9.75, 1 pound for $19.00 and 2 pounds for $36.00. Individually gift wrapped, this bag makes a statement. As part of our all occasion round white gift basket or our oval white basket with our gold and white color theme, these bags contribute to a great presentation. The Baby Toys bag has pictures of blocks, ducks, rocking horses, stars, pacifiers and rattles in yellow, blue and pink. It is suitable for boys or girls and is appropriate for any baby event, such as: a baby shower, a baby's birth, small child birthday, baptism or adoption. This comes in a 1 pound bag only for $19.00. 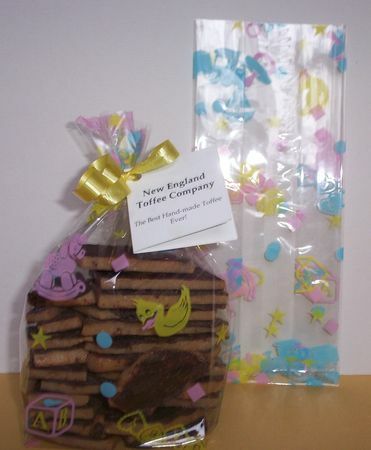 Buy a bag, or order as part of our Baby Theme Gift Baskets. The Porcelain Eggs bag contains a border of small pastel eggs around the top and larger pastel eggs in grass along the bottom. The eggs are yellow, green, blue, purple and pink and orange. It is suitable for Easter. This comes in a 1 pound bag only for $19.00. 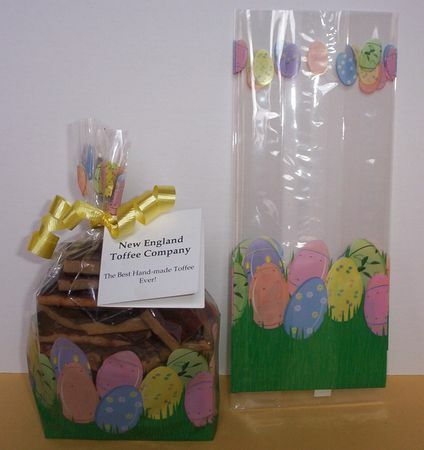 Use in your own basket, or order with our Easter Basket or Easter Pail. The Heart Strings bag has red and white hearts. It is suitable for many occasions, such as Valentine's Day, Mother's/Father's Day, anniversaries, "I Love You", and "Thinking of You". This comes in a 1 pound bag for $19.00 and a 2 pound bag for $36.00. 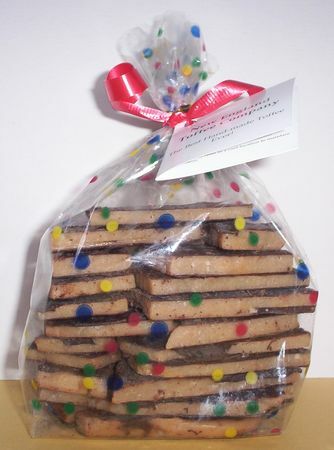 The Party Confetti bag is splashed with confetti and streamers. The confetti is yellow, purple, and red. The streamers are yellow, red, green and purple. This bag is suitable for any type of party or celebration, such as birthdays, anniversaries, bridal showers, weddings, graduations, congratulations, new job, or new house. This comes in a 1 pound bag for $19.00 and a 2 pound bag for $36.00.